The morass of Boxing Day mud and not-mud is navigable on the farm animal sanctuary. We need some snow to make it all pretty again, and to keep Cranberry Run flowing. The little creek, reduced to sparse puddles during this dry summer, is on the move enough to water wildlife, but the old quarry is still much drier than it should be, with the wetland reduced to the southeast springs. Without precipitation in some form, bulbs of blue flags, dragon’s tongue and beard will become dormant again. I know we’ve talked a lot about osage oranges here, and I’m going to again. Yesterday, we noted that the whole fruits are now reduced to trails of Chartreuse and ochre meal, leftovers from the forages of squirrels and other herbivores who are foraging for anything to raise their fat reserves. For so many reasons, I wish they could eat bush honeysuckle and lots of it. We humans will have to keep chopping away at that…only fair, since our kind brought it here. Inside artificially heated four walls, we welcome a new resident. 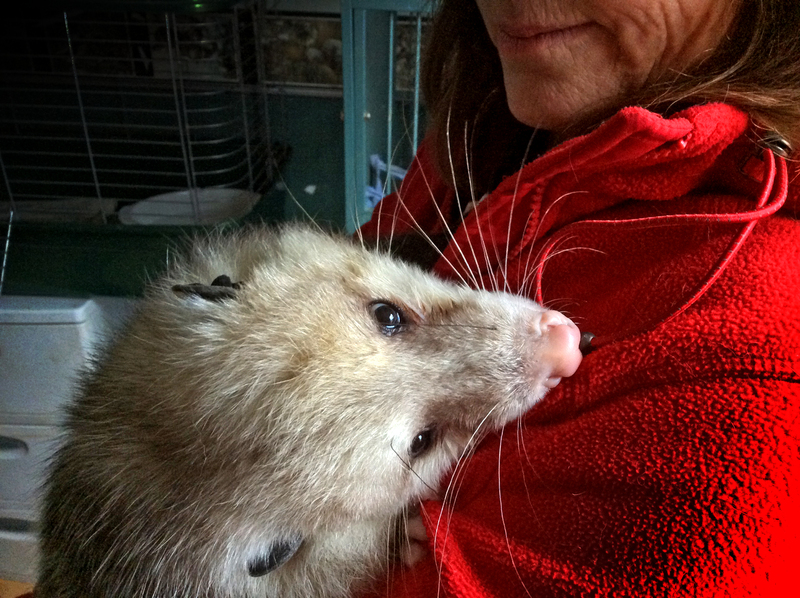 Thanks to the Ohio Wildlife Rehabilitation Association and the Stark Parks Wildlife Conservation Center, a Virginia opossum will venture into classrooms and programs as an educational ambassador with The Quarry Farm. Like Captain John Smith, another North American marsupial “he”, this Nature’s garbage collector will help people learn more about the vital role his kind plays in world health and balance. Here’s the thing. We can continue to call him “he”, “the Virginia opossum”, “OP2” or other nonspecific things. As he is an adult, with a guesstimated age of one year, the short anticipated life expectancy of Virginia opossums means he may not be with us for more than a couple of years, max. But don’t you believe that he deserves more than that, whether he cares or not, as long as we keeps the scrambled eggs, cat and dog food, veggies and fruits coming? So as with the Captain, we invite you to submit potential names for the new guy. Reasons behind your nomination are welcome. After all, we walked away from the last contest with a wonderful American History link as well as a memorable name for a memorable soul. Here’s what we can tell you about this little man. He was found by a Stark Parks visitor. This animal was approachable (not normal), wasn’t thrilled about being picked up (normal) but allowed it (not normal.) The easy catch was probably because he had, sometime in his recent past, suffered from head trauma, likely hit by a car while scavenging on or along a road. Because of the injury, he doesn’t move quickly and has permanent head tilt. He does, however, like his grub and was able to find it long enough to allow him to heal in the wild. Luckily, a kind, potential predator found him before a determined actual predator did. On December 17, we drove to Hartsville, Ohio. He made the journey to Putnam County, Ohio with us that same day. There’s a Quarry Farm apron or t-shirt (winner’s choice) in it for the winning entrant. Please submit names (and stories; who doesn’t love a good story?) 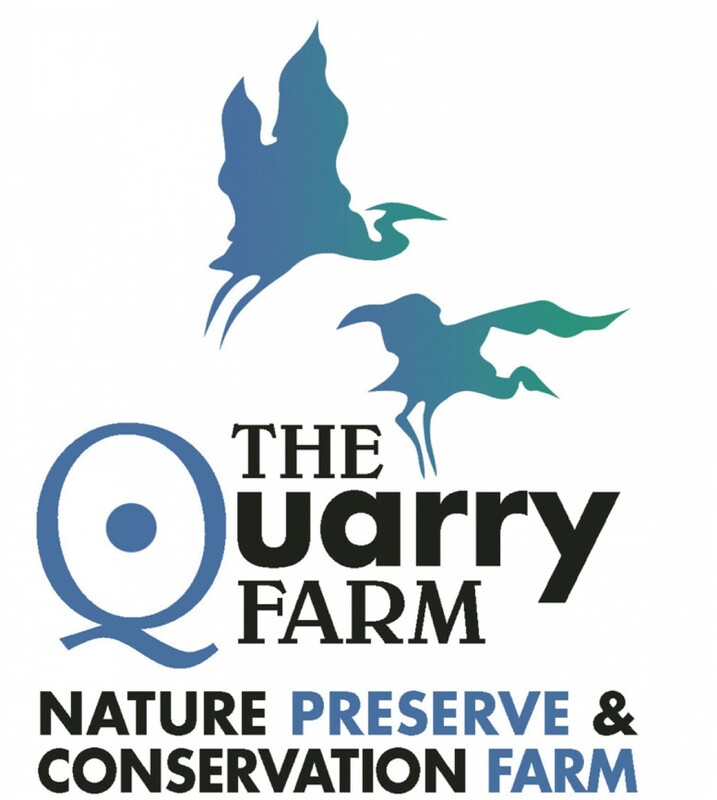 to thequarryfarm@gmail.com by the time the ball drops on Jan. 1, 2017. Many consider the ideal Christmas morning to be filled with snow and soft lights. I myself would love another three to four feet of snow, as I love winter. 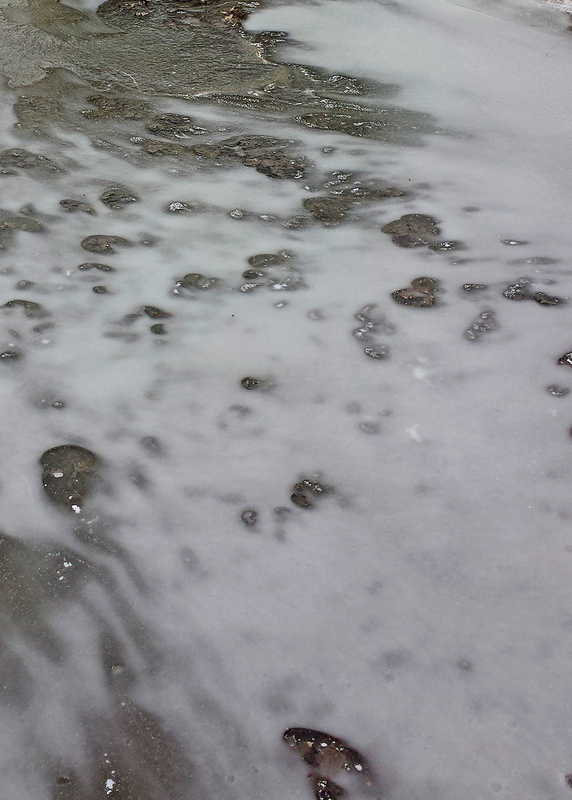 We have a few sheets of snow interspersed with cold, sodden earth. Here on the Quarry Farm, we have a rather muddy Christmas. The pigs started knocking on the door at 6 am. The donkeys brayed when the lights flipped on. The goats burped softly and shuffled around in their coats. The chickens quietly werked in the predawn, nestled in their coop. Everyone has been fed and the mid-afternoon snooze is setting in. Lolly and Beretta are curled up in their respective beds, slightly snoring, quiet after I tried to get them to wear bows (I thought Lolly was going to eat it). Even Jimmy is quiet, stretched luxuriously in his hammock, waiting for me to clean his cage. The wind is coming quietly from the east, and I hope we have a nice winter coming in. Some snow, with mild temperatures would be nice. But for today, we’re all quiet and enjoying a nice holiday. I plan on eating a nice meal with the family soon. Whatever you wish to celebrate today, if it be just that there is a new day, we all wish you well. On Thursday, we buried a friend of ours: Marshmallow, a Nigerian dwarf goat whose gentle disposition touched a lot of lives. I’ve already related this, clumsily fumbled my way through a post that was part eulogy, part obituary and completely inadequate in relating the true nature of this incredible being, how important he was to all of us here on The Quarry Farm and to those who had the good fortune to interact with him, however briefly. Something happened, though, while we were burying him, the relating of which I hope will make up for my failure. Yesterday, I dug a hole. If you follow these posts, then you already know this. I dug the hole, then I drove the seventy-some miles to Marysville to pick up the husk that was Marsh. Marsh’s brother, S’More, was lounging near the gate, watching as I left, and he was still there roughly three hours later when I returned. I pulled in, closed the gate, then maneuvered my car over to the site we’d chosen to return our dear friend’s biomass to the Earth. It took me a few moments to jockey the body from the backseat, ease it into the hole and manipulate it into position, muttering apologies the whole time. That Marsh wasn’t there to hear me was apparent. I was simply pouring sound into absence. As I took up the shovel, scooped the first blade of dirt, I saw S’more come up on my left between me and the now not entirely empty hole. He was agitated, his tail flicking furiously as he paced the circumference of the pit. Every few steps, he’d stop and lean down toward the shell of his brother. His nostrils would pulse and he’d falter a bit, one foot pawing tentatively at the open air between them. I waited until he was on the far side of the hole before I threw the first shovelful of dirt, then three more in rapid succession. As I was reaching for the fourth, S’More rounded the corner, stepped up to me and leaned the crown of his head against the handle of the shovel, holding it in place. I rubbed his neck for a moment, easing him away, then threw a fifth, and then a sixth shovelful. Turning for another, I found myself surrounded by all five goats who live here: Willow, Elora and Madmartigan, the three pygmies; Mister Bill, the giant Boer-mix; and S’More. While the pygmies paced the pit, nostrils flaring, Bill gently hooked me with one horn. This isn’t unusual behavior. Bill loves to rub the side of his face up and down whomever will stand and tolerate it. In the process, his curled horn will lock a body in place, glide up and down a hip or leg or side as he rubs. This time, though, he simply applied a gradual pressure that pushed me away from the dirt, away from the hole and, by necessity, the body in it. For a few minutes, I soothed them all: rubbing the spot between Bill’s horns that he most dearly loves rubbed; stroking S’More’s neck and gently scratching his rump; talking quietly to Willow, Elora and Martigan, none of whom are overly fond of physical contact. When I resumed my task of shifting dirt from mound to cavity, the herd wandered off together and took up observance from the top of a small hill of dirt-filled tractor tires, a form of enrichment that Rowan constructed during her last visit home, some sixty feet away. They stayed there, all five of them, until I’d finished. Then, once I’d climbed the steps to the deck on the west side of our home, they left their perch and moved to surround the grave, staying there for several minutes before moving off to graze on the opposite side of the property. It’s been suggested that we can’t truly understand the motivations of animals, that in trying to do so we attribute to them emotional responses that they simply don’t have. But it’s not they who are lacking. It’s not they who fail to understand. In the end, I know what I know. I know that they are grieving. I know that they are sharing that grief. It took seventy-four minutes to dig a hole this morning; just over an hour, with shovel and pick, to create a nothing four feet by three feet by four feet deep. I had thought it would take longer, prove harder, given the heat and the dry. But, no. Just seventy-four minutes. Time enough to come to terms with the harsh reality of the past thirty-six hours. In early July of 2010, Marshmallow and S’more, two Nigerian dwarf goats, wethers both and brothers by all accounts (though the two couldn’t be any more different), were delivered to The Quarry Farm by Anne and Rowan, who brought them north from Cincinnati in Anne’s little Scion xA. Their arrival fortified a growing vision of The Quarry Farm as a safe haven, a home and sanctuary for the unwanted and the unloved, the abused and the forgotten. Which is not to say that all of the animals now living here were unwanted or abused. Buddy and Lucy and Bill and Beatrice all came from loving families who, through circumstances undesired, were simply unable to keep them any longer or believed them better served on The Quarry Farm. And so, too, it was with the brothers (if not by blood, then certainly in spirit). The family that raised them to that point loved them, and dearly. Sadly, the two large dogs that also lived with the family loved them as well, though in an entirely different and specifically threatening way. Thus the trip north. Marsh and S’more (The Boys as we came to affectionately call them), when they arrived, joined the Priscillas, sixteen Hubbard Golden Comet hens, and Johnny and Stella, two non-releasable Canada geese; the sum and total of The Quarry Farm’s inhabitants (not including the three dogs and eleven cats). S’more, was, and still is, slim and athletic, given to spontaneous bursts of energy that found him bounding sideways and pronging through the yard. It was clear from the beginning, though, that Marsh had issues. While he’d chase after his brother, bash heads and sport about to the best of his ability, he was prone to a constant mild bloating that, despite our best efforts, made it difficult to keep up. On more than one occasion, a visitor would ask if “she” was pregnant. What he lacked in athleticism, though, he more than made up in personality. Frequently the first to greet guests, Marsh was sweet and gentle, curious and approachable and children thronged to him. He’d greet them, and us, with his head tilted up, encouraging any and everyone to stand nose-to-nose with him. But while willing and even desirous of the attentions of others, particularly when they offered bits of fruit or carrots or peanuts, Marsh was clearly bound to S’More. Inseparable from the first, the brothers would play together, eat together sleep together and wander the property together, often pressed up hard against one another, shoulder to shoulder, moving about in a coordinated tandem. Now, I ache for the one without the other. A little less than three years ago, we found Marsh standing in the yard, straining to urinate, but unable to do so. We called Dr. Ron Baldridge, a local veterinarian, who, over the phone, diagnosed bladder stones. Unlike kidney stones in humans, bladder stones in goats, due to their unique and convoluted physiology, will, untreated, prove fatal. Explaining that goats were outside his purview, Ron recommended contacting Ohio State University’s Veterinary Hospital. There, they surgically removed the stones and, after a week, Marsh returned home. Here, we worked to acidify his diet, providing ammonium chloride in periodic drenches and pouring gallons of apple cider vinegar into water troughs. Even so, ten months later, they reoccurred, necessitating another trip to Columbus and a second surgery. And again eight months later. Wednesday evening, we found him once more, his belly distended. On Thursday, we drove him to the OSU veterinary facility in Marysville. That evening they called with disastrous news. Early Friday, I brought what was left of him home. It took seventy-four minutes to dig a hole this morning, and even less time to fill it in. But there are holes and there are holes, absences that no amount of effort can ever fill. So, then, because there is nothing else to do or say, goodbye, Marshmallow. Goodnight and sweet dreams. As temperatures climbed and the sky turned hazy yellow from blowing topsoil, we anchored the canine hammock in the Forester. 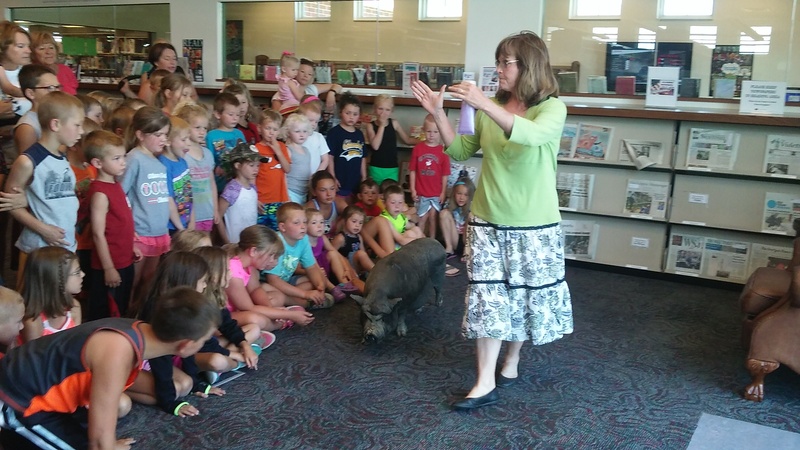 Sophie is joining us every day through Thursday this week at all eight branches of the Putnam County District Library. The first stops were among the shelves at the main branch in Ottawa and the community room in Kalida. I should point out that Sophie was to visit with young patrons on the neat linoleum rectangle of floor off the French doors in Ottawa, but just try and tell a pot-bellied pig that he or she isn’t going to wander through the fiction section or the young adult reading room. I dare you. Luckily, we had a banana with which to entice her back to the party. Back at the farm in the cool of the evening, Miracle Max came out to dance. If only Humperdink and Inigo had joined in, we could have filmed a quadrille.